After ten months of struggle across musical battlefields nationwide a crucial strategic breakthrough has been achieved. Rock ‘n’ roll has scored its first decisive victory by penetrating the fortified defensive perimeter of the long held music strongholds, notching their first chart topping hit with Wynonie Harris reaching the pinnacle this month with Good Rockin’ Tonight. With that announcement a beachhead on the mainland has been established and more troops are being landed ashore as we speak. The tide of battle always turns on such moments, whether in war or in music. As long as the resistance against this incursion holds strong there’s still hope on the side of the occupiers that they can hold out and prevent a full-scale invasion and a nagging uncertainty on the attackers that has them wondering if they can ever break through. But rock ‘n’ rollers weren’t just any assault force. Though largely an untested regiment with just a few soldiers of fortune scattered amongst them to bring much needed experience, they were unrelenting in their attack from the moment hostilities ensued. Their initial maneuvers in the fall of 1947 had resulted in just incremental ground being gained but with the arrival of an elite corpse of saxophonists they began to bombard the enemy encampment over the winter months, rattling the eardrums and concussing the minds of the defenders of the musical status quo until the defenses began to crumble. Wielding their horns like incendiary weapons they carved out vital territory for the flotillas of landing troops that were now storming the beaches. As Commander Harris planted the Rock flag on land the war had irrevocably shifted. Though there was still a decade or more of bloody battles to endure, rock ‘n’ roll would forever remain on the offensive from this point forward, gaining ground, wracking up victories and overthrowing musical kingdoms with alarming precision. The old world order of homogenized pop, pleasant jazz and dippy novelties would never again have the unlimited power they’d enjoyed since recorded music had arrived on the scene in earnest two decades earlier and would eventually have to capitulate and head to the bargaining table in order to merely keep their own sovereignty intact. If music was covered like war that might well have been what the reports from the frontlines read like in the late spring of 1948. As it were though Billboard magazine was noticeably silent on the issues of the ongoing battle in the black music territory. Earl Bostic had been one of the leaders in this branch of the service from the beginning, a commanding officer if you will, one of the first to enlist in rock’s saxophone brigade way back in late 1947 and he’d launched some of the earliest successful campaigns rock forces enjoyed, notching victories in smaller territories with his first two rock efforts 845 Stomp and Hot Sauce! – Boss hitting big in Cash Box charts for Harlem, Chicago and Los Angeles in the initial months of 1948. By the spring rock launched its most effective campaign and Bostic was at the forefront of that as well, enjoying his first national hit in Billboard with Temptation, making it the eighth single by a rock artist to score in the four weeks since the magazine began publishing its brand new “Best Selling Race Records” to supplement its “Most Played Jukebox Race Records” listing that had been the only measure of the black communities musical tastes prior to that. That publication could have hardly picked a more revolutionary moment to expand their surveys in this field as the rock ‘n’ roll expeditionary forces were moving inland at a rapid pace. By the fall of 1948 rock artists typically accounted for half of the entries in a given week on those charts. Though the defending forces of the old guard musical styles were still prominent alongside them in the weekly rankings they were suffering mounting casualties, or at least diminishing returns, and so looking back at June 1948 we can safely say that rock ‘n’ roll’s D-Day had indeed arrived. The ironic part of all this is that Earl Bostic had been a member of that older brigade himself when starting out. A jazz musician who defected to the rock ‘n’ roll forces springing up across the countryside there may have been some across the border who viewed him as a traitor for his actions, but regardless of the legitimacy of that charge he wore his new uniform with pride. The first eight months or so he was enlisted in the rock ‘n’ roll army (I know, I know, I’m carrying this analogy WAY too far, but it’s too late to turn back now) Bostic was all but infallible, but after making steady advances commercially he would now get bogged down in the trenches, battling for meaningless ground in the hinterlands as summer went on. From this point forward it’d take him a couple of years before he was a major force to be reckoned with again. So how did he get off track? Was it a case of Bostic’s own varied interests getting the best of him and veering off the path that had gotten him his best returns to date? Did it have anything to do with his records being issued first on Gotham and then picked up for wider distribution by King? Or was it just that other sax players – those with less talent than he possessed – were now increasingly honing in on the specific components needed to connect themselves and by emphasizing those attributes more consistently they were now poised to draw the most attention from the rock audience going forward, thereby ending Bostic’s exclusive hold on such techniques? It’s probably all of those reasons in some way and the simple fact that to date Bostic had only really shared the stage with Paul Williams in the saxophone army and now there were so many new recruits that there was no shortage of outlets to hear all the honking and squealing you craved. 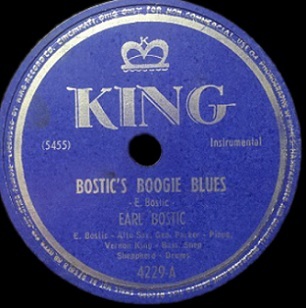 Following Bostic’s Boogie Blues his next few releases would venture into pop territory and though he’d return to rock styles before long he never quite approached it with the same single-minded intensity as he’d shown when starting out. Yet his reputation in the field was still strong enough to ensure that he’d always draw notice for each release, even when, at times, the attention was a little misplaced. Case in point, Cash Box said of this release, “Both sides rock throughout” but unfortunately the majority of the top side, Barfly Baby is taken up with Roger Jones’s vocals and a mellow shift that undercuts it considerably and hints at what is over the immediate horizon for Bostic’s output. 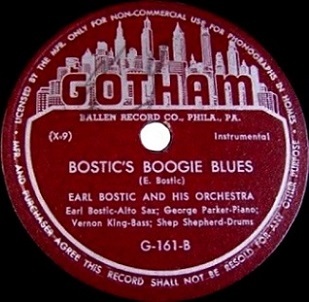 Not so here though where Bostic’s Boogie Blues offers up another example of why Earl Bostic was still holding to his position at the forefront of rock’s sax instrumental tidal wave that would spend all summer crashing on the musical shore. There’s certainly nothing about this record that makes Bostic’s Boogie Blues ill-suited to reside comfortably within the multitude of rock sax performances that are filling jukeboxes across America midway through 1948. If anything this is standard issue equipment for the mission at hand. After a brief lead-in that shows off the tonal difference that Bostic’s alto had compared to the more common and robust tenor sax, almost sounding as if it was imitating a clarinet, he shifts down into a more muscular passage that serves as the prolonged intro wherein he could easily be mistaken for utilizing a tenor. Bostic plays this with firm grip on the sinewy passion that all rock horns were expected to uphold, a sense of cocky disdain for the “sweet” sounds that jazz, pop and big band styles had relegated their horns to carrying off. In contrast to those styles rock has a chip on its shoulder, a restlessness about it all, impatient you might call it, not that it’s playing in a hurry by any means, but rather he gives off a sense that something unruly is happening around the corner and he’s looking forward to jumping into the fray. That slightly hostile vibe most sax instrumentals project keeps listeners on their toes, like being jostled in a crowd that’s moving as a singular entity rather than each participant meandering along at their own speed. You keep pace because to resist that surge means you might get knocked to the ground and trampled underfoot. Yet as you keep moving the familiar signposts of the form come into view. The walking bass carried by the piano, the drums giving you a kick in the pants every so often and the throbbing melody that Bostic employs to keep you transfixed. It’s held down by a slinky rhythm, rising and falling as it goes along, seductive in a way even as it maintains a hint of menace about it. When the piano takes over for the mid-section that sense of danger subsides considerably but if you let your attention shift from the keys to the bass playing in support you might not fully break out of the spell. Yes it’s a step down in terms of the mood that had been created, but it’s not a mood killer if that’s what you’re fearing. The problem is that by the time Bostic returns, which of course is a welcome sight, the record is almost over. He gets back up to speed quick enough but there’s no extended soloing to enjoy, no ramping up of the intensity, no explosive back and forth exchange with the drummer or nimble byplay with the piano. Instead it’s almost as if you feel something more exciting has been edited out because the record simply winds down rather than heats up again. As such Bostic’s Boogie Blues comes off seeming shorter than its two and a half minute run time and while it serves its purpose well enough, giving rock listeners what they’ve come to expect from their instrumentals, it doesn’t elevate it from what we’ve already heard. In fact – as reliable though it may sound with all of its parts fitting together as laid out – this is almost a case of Bostic going through the motions. Rock saxophone by the numbers. Therein I think lies the answer to the question of why Earl Bostic didn’t pursue rock exclusively from here on in. His talent level on the horn was unmatched in this field but the rock audience’s desire was rather limited. Basically, to this point for sure and even for much of the foreseeable future, they were merely content to hear more of the same. Get them moving, grooving, rocking, rolling, grinding and sweating… then do so again. And again. Jazz was a more a complex style that encouraged improvisation and rewarded (at least in terms of peer approval) performances with a high degree of difficulty. Rock on the other hand sought a primal audience reaction each time out, one that Earl Bostic was more than capable of eliciting yet which once accomplished left him with little to prove the next time around. These rock fusillades were monotonous by nature and I’m sure that frustrated him. It wasn’t that the myriad of pop numbers he’d tackle in the coming years were either technically difficult or stirred anybody’s passions but they were at least varied in their approaches. He could play around with the melodies, he’d start adding other instruments (vibes in particular) to elicit a different feel, and on the stage he’d be able to freely mix in those eminently familiar songs with the more adventurish jazz excursions while still utilizing the frantic rock numbers to bring audiences to their feet to close out the performances on a high note. If you want to knock the limited musicality of rock ‘n’ roll here’s your chance to do so, as Earl Bostic had risen to his highest commercial level playing the devil’s music and now that he’d done so he was content to increasingly look elsewhere for other kinds of fulfillment. He’d still keep his hand in rock and would deliver some more excellent sides along the way but it’s almost as if he was content knowing that he’d drawn up the plan of attack for the next generation to follow and now that those artists were breaking through he could leave the frontlines behind. Leave a reply on "Earl Bostic: “Bostic’s Boogie Blues”"